Blooper. the new mascot for the Atlanta Braves. The Philadelphia Eagles are in the Super Bowl, and the Flyers and Sixers are both hanging on to playoff spots after tearing through January on respective hot streaks. In other words, for many of you, baseball and the upcoming Phillies season may not be the first thing on your minds right now, and that's understandable. With that being said, this needs to be addressed. What the heck is this, Atlanta Braves? The Phillies' NL East rivals revealed their new mascot Sunday. Its name is Blooper. Blooper is a sad, pale being who is apparently the product of some mad scientist. He also bears a striking resemblance to the best mascot in sports — the Phillie Phanatic — something many were quick to point out. 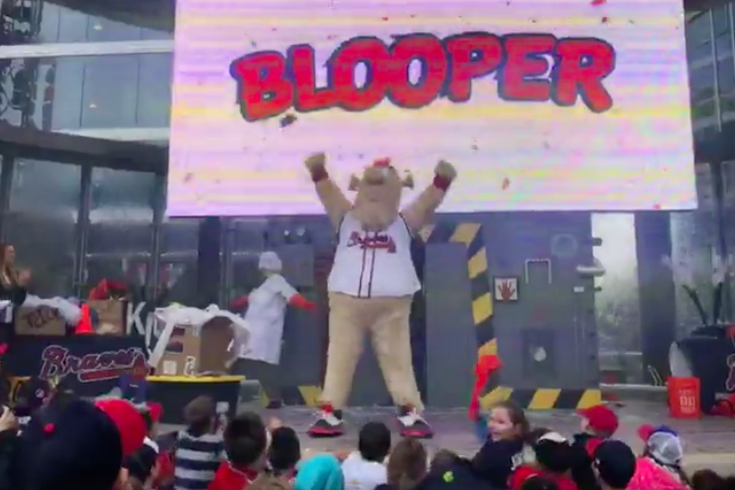 If nothing else, Blooper looks like the lovechild of the Phanatic and the Houston Astros' Orbit. It certainly wouldn't be a surprise, considering the way they've flirted with each other in the past. The Braves had an obvious hurdle to clear in picking a new mascot to replace Homer, the potentially sadder Mr. Met knockoff. Many consider their team name to be offensive to Native Americans, so choosing a mascot even loosely related was not an option. But geez, the team essentially went from ripping off one division rival to copying another.